A few weeks ago, I drove about an hour from my home in Upstate New York to Dimock, Pennsylvania. Dimock is a tiny town in the midst of green fields and sloping ridgelines--the kind of bucolic countryside that drew me to this region over a decade ago. But now Dimock represents a future I dread. More than 60 natural gas wells have been drilled into Dimock's fields and dozens more are on their way. In the meantime, wells have exploded, drinking water has been contaminated, and radioactive water sits in holding ponds on farmers' land. This industrialization of Pennsylvania's rural countryside is part of a natural gas gold rush that has descended on the Marcellus Shale--a formation that stretches from West Virginia all the way to New York State. To get to the natural gas buried in the shale, companies do something called hydraulic fracturing, known as fracking. They drill down and inject fracking fluid--a mixture of water and some of those 590 chemicals--into the well at high pressure to blast the rock apart and release the gas. 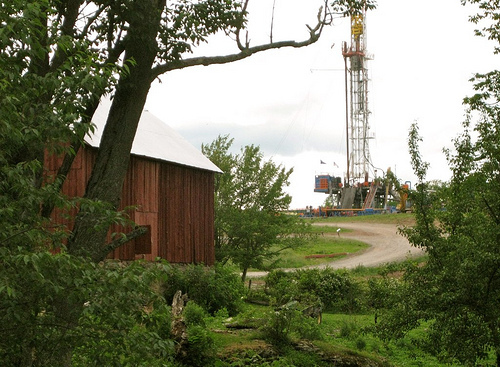 Like most gold rushes, this fracking boom is pretty lawless. A loophole in the Safe Drinking Water Act exempts it from all regulation. This isn't even a case like the Deepwater Horizon disaster in which BP disregarded the rules. There simply aren't any fracking rules for companies to follow. The results speak for themselves. When I traveled to Dimock--along with some experts from NRDC, Riverkeeper, and Catskill Mountainkeeper--we visited one farmer who had three wells on his property. Each well head had one or more giant pieces of equipment used to bring up fracking fluid, big feeder pipelines, and huge wastewater tanks. I couldn't believe how loud the whole operation was. What used to be a quiet farm was now an industrial site. I visited one of the residents downhill from one of these wells. His drinking water is now contaminated. The gas company had to install a huge filtration system in his basement, but still his water isn't safe, so the company trucks it in. I asked the guy how the deliveries work, and he said, "They come whenever they want to. They open my garage door without asking and fill the tank up." This man has a little boy who is afraid of the methane gas coming from the wells. He asks his father, "Are we going to wake up tomorrow?" People like this family have nowhere to turn. The state agency supposed to oversee the drilling is what you call a captured agency: the people regulating energy companies are also supposed to promote gas permits. You can't do both at the same time. We all know how well that worked in the Gulf. It would be easy to lose hope. Especially after regulators failed to protect Americans from BP, from mortgage meltdowns, and here in my corner of the world, from fracking. But I am not ready to give up the fight, and here is why. I have traveled to Albany to talk to elected officials. It has taken many trips, many conversations, many citizen activists, but I have seen the tide slowly turning. Some politicians are starting to realize that letting industry run roughshod over the state may not be good for New York. 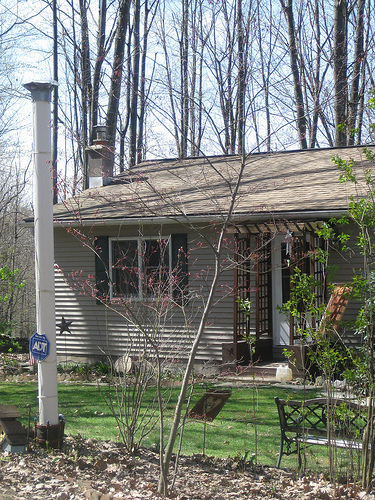 There is increasing support from both political parties for a bill pending in the statehouse that would place a moratorium on natural gas drilling in New York until May 15, 2011. Our representatives must protect New Yorkers and pass it this week while we're in special session. We must learn from what happened to Dimock, and all of us have to keep the pressure on until we get the safeguards we need. But this fight isn't just about what happens to Dimock or even New York State. It's about how we want to live for the next 30 years. Do we take the dirty-energy money and run and screw the consequences? Or do we build something more sustainable that doesn't hurt the people around us? Which do you choose? This blogger also appears on NRDC's OnEarth.org.